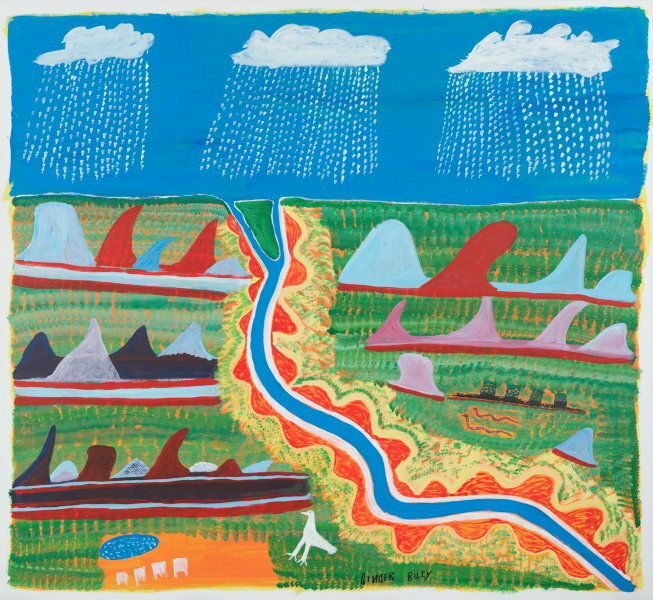 Ginger Riley Munduwalawala painted his mother's country, focusing on the weatherworn rock formations known as the Four Archers near the mouth of the Limmen Bight River in south-east Arnhem Land. Using bright, luminous and often contrasting colours and strong flattened forms, Riley depicted this landscape and its ancestral beings: Garimala the snake, who created the Four Archers; Ngak Ngak the white-breasted sea-eagle and guardian figure; the ceremonial shark's liver tree; the Four Archers themselves; and the Limmen Bight River. Riley's extraordinary creativity allowed him to reinvent this subject matter again and again, expressing in his work his vision of physical geography, creation knowledge and ancestral sites. His strong sense of place enabled this overview, and he painted, he has said, as if he was, '... on a cloud, on top of the world, looking down ... From the top I can see country right down to where I come from'. Riley saw the work of western Aranda watercolourist Albert Namatjira as a young man in the 1950s. This meeting with Namatjira made a lasting impression, and much later inspired Riley to pursue painting in acrylics when the Northern Territory Education Department offered a painting course at Ngukurr, where Riley was living, in 1987. Riley rapidly developed his own very distinctive style and iconography and, after initially exhibiting with the other Ngukurr-based painters, he established an independent career at the Alcaston Gallery, Melbourne. Riley exhibited both nationally and internationally, and was awarded an Australia Council Fellowship in 1997 the same year that the National Gallery of Victoria, Melbourne, mounted a retrospective of his work. In 'Nyamiyukanji, the river country', 1997, Riley depicts the dramatic rock formations that rear up out of the Gulf country landscape and are known as the Ruined City. This is Riley's grandfather's country, near the Nathan River. As in many of his works, Riley has painted the rocky outcrops and surrounding land in bands across the painting, while the river winds diagonally up to the sea. At the top of the painting, the bright blue sky, which is not differentiated from the sea at the mouth of the river, has large, wet season clouds raining on the landscape. In Riley's work, clouds or the sun usually represent his mother. Ngak Ngak appears in the foreground and, on the right, Garimala travels across the country. This place exists in Riley's creation knowledge as much as it does in the landscape. Signed bot.c., black fibre-tipped pen "GINGER. RILEY" ["N" is reversed]. Not dated. © The Estate of Ginger Riley. Courtesy of Alcaston Gallery, Melbourne.